Can you see the problem here? Paint.NET's site SCREAMS 2007. It looks really old, unappealing, and messy; exactly not the first thing you want people to see when they want to try an editor. On both examples, the download button is very obvious and easy to find. Everything is straight forward. There is not a wall of text full of ugly blue links and unnecessary info (nobody uses that search bar, nobody wants a wall of 2007 awards as the first things they see and there's no need for all the languages supported by PDN to be listed under the hard to spot download link). The site needs to be updated. If you want, I could help you with that. The UI has really old Windows 7-ish icons that could use a bit of love. Office icons and Material icons are good examples of modern icons that could replace the current ones. Is just broken. The dialog text doesn't fit the top bar. Why not use icons for the tool dialogs (tools/colors/layers etc)? Come on. This looks really ugly. The contrast is too radical! The UI components need to change as well (buttons, text fields, scroll bars) and the icons are also a bit too light and saturated. I know what you might say: there are plenty of plugins that add those. And you are absolutely right, there are. But if we are going to rely only on plugins, PDN might as well just be an engine. Plus, most of these are kind of finicky and weird to use, since plugins can only be effects and not things in the tool box. Not to mention most people don't use plugins. Also, there's only a single brush type. I can almost see not having custom brushes, but ONLY having circular brushes is kind of silly. TL;DR: The website is ugly, the UI is ugly, the icons are ugly, there are not many tools and some of them need improvements. My intention here is not to trash PDN, all I want is to improve this application so it gets more deserved love! Paint.NET is basically written by one guy, @Rick Brewster. So, it is not surprising that other software that have huge teams of programmers working on them have more features. Personally, I think Paint.NET is amazing. I started using it at v1.1 and the progress I've seen over the years is HUGE. Yes, there are. Rick understands that he can't do it all himself. That's why he implemented a plugin system. While it is true that the plugin system is limited. What you can do with it is sometimes amazing. Why not redesign the web site? 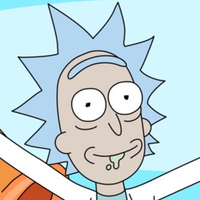 Why not code a plugin so good that Rick has no option but to put it directly into Paint.NET itself? Or, are you just here to complain about FREE software? @HCGS, these are mostly valid points, and have been brought up before. But come on... saying the contrast in the Color window is too radical. That one seemed a bit trollish. There are already plans underway to update the website (last I heard anyway). It was in light gray, I missed it. I apologize if I came out as rude. I was aware that Rick was a developer, but I wasn't sure he was the ONLY one. And I don't want to just complain for the sake of complaining, I wanted to bring to light the main issues with the software so Rick can focus on them on the next updates. But once again, sorry if I offended. Blurry pictures give me a headache. My suggestion to @HCGS would be to include some rotating banners show casting some of the images made and/or manipulated in PDN. A quick look in the Galleria would show some of the best artworks created entirely in PDN. I would also love to see some tools like smudge and liquify become part of the permanent tools of PDN instead of being plugins, and I am sure that Rick is planning to incorporate that. If you have read the popular feature requests, you will see that Rick is aware of what the folks want. I have no problem using the plugins because it enhances the user experience with the software. I would love for there to be a custom brush, and the Brush Factory plugin is far superior to Simon Brown's custom brush plugin. Again, the popular feature thread has those future installation. I would also like to see the default layer blending options expanded to truly compete with GIMP. I have been using PDN since before 3.5.11 came out, and I have managed to work within the limitation of PDN utilizing plugins and workaround. It makes it a challenge and enjoyable, while passing on some tricks to other artists in the community. 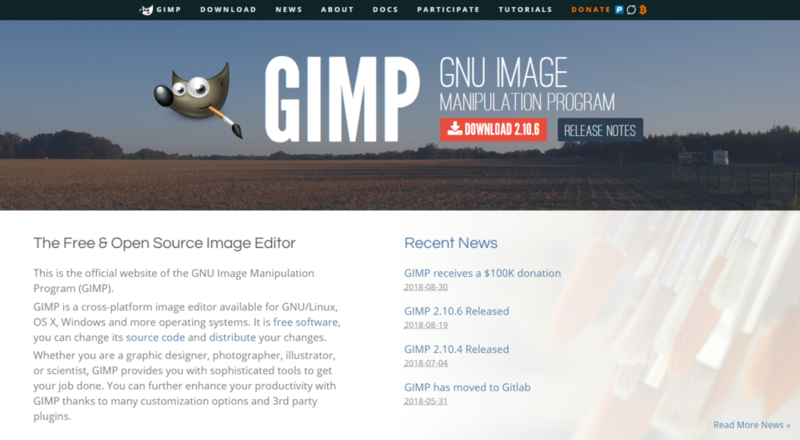 I've been using PDN since v3x and Gimp since v2.8x. PDN is a very good free image editor and is more than enough for most ordinary image editing users. For the "Advanced User", Gimp is a better choice with Masks, Groups and paths, not to mention more advanced plugins. Still, PDN certainly can produce excellent results when properly used. I often suggest PDN to Windows users, because it works so well. While I'm awaiting Rick's input/approval/upload, I continue to supply updates as new versions of our favorite image editor get rolled out. I'll post a screenshot soon. Looking forward to those screenshots @Ego Eram Reputo! I'm glad this has already been addressed. By the way, has the logo changed? By the way, has the logo changed? Opinions are what make for great democracy. I like the no frills UI. Easy on the eyes ... ease of access to all you want to do. The website - I guess I'll never visit it because I've already got PDN so no reason to. Or is there ? May I, as a newbie to the forum , but fairly long-term user, add my four-penny-worth to this lively discussion. Firstly - thank you for a great free product. Secondly - Some people (me) struggle to see pale grey text and can spend frustratingly long periods of time searching for items, such as scroll-bars, which are hidden until you hover over them. Keep it simple, fairly bold contrasts and intuitive please. There's a lot to cover here ... and replying to this will, at the very least, help me to organize my thoughts and is a good opportunity to broadcast what I've been thinking and planning for Paint.NET's future. What you've discussed is many years worth of work, by the way. Patience will be needed. And I don't necessarily agree with everything ? The website screams 2007 because I made it in ... 2005 or 2006. I'm not a web developer As @Ego Eram Reputo mentions, there's a new design that is awaiting my attention. It's very high up on the list, and will probably be what I tackle once 4.1.1 is out the door. The Windows Store is also a really great place to get Paint.NET now. There's a 30-day trial and then it's a few dollars, and it's always up-to-date and whatnot. 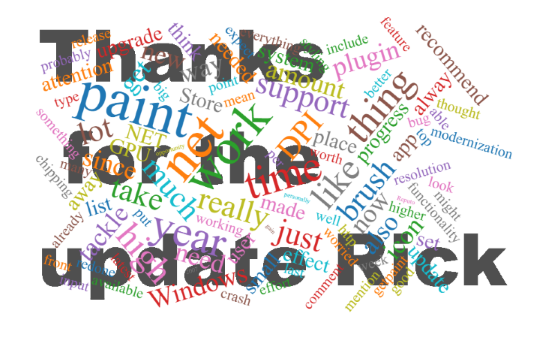 If you want to recommend Paint.NET to a friend, I would like to recommend to you to recommend this approach It used to take an entire week for me to push out an update due to Microsoft's lengthy certification process, but 4.1 was approved in about an hour (which is a really big deal! ), which means several weeks per year of wasted time is no longer an issue. I personally think the UI icons still look quite good and pleasant, and I'm okay with them compared to the amount of effort it takes to update them. Well, maybe the better way to put it is that I'm less worried about the styling and much more worried about the resolution. Thankfully, there is already some preliminary progress being made here thanks to @Zagna: https://forums.getpaint.net/topic/111729-high-res-icons/ . And, since the whole icon set needs to be redone to support higher resolution, the styling may get a ride too, probably to mimic the latest Office style. However, don't load up on the expectation that Paint.NET's icon set is always going to be following the latest fashions. It's just an obscene amount of work, it can only be done so often. There are more updates planned for improving Paint.NET's support for high-DPI. WinForms was finally updated to support multi-monitor mixed-DPI, so I'm hoping to get Paint.NET hooked into that as well. High-DPI is something that I've been chipping away at steadily for the last few years. Just look at the roadmap and search for "DPI". I would not expect a radical departure from the current set of UI components, like you called out on the Colors form. Standard Win32 controls work, and the only reason I'd depart from them is if I were to rewrite everything in a new UI framework. I would not place any bets on that happening. It would be an insane amount of work for a very small subjective gain. Lack of tools, as you put it, will be chipped away at as time goes on. Flip Horizontal/Vertical should be straightforward. Some of the others are available as plugins. You don't define what you mean by "Align" and "Mask" so I can't really comment on them. The plugin system itself needs a lot of upgrades; in 4.1 I unfortunately had to block the Content-Aware Resize and Bulk Updater plugins because of how they forcefully integrate themselves via reflection. I can't really take offense at what they had to do to accomplish their goals; I'd really prefer to make a plugin system that provides them what they need. And, of course, BRUSHES. This should be a rich staple of an app like Paint.NET, and it's not, and it continues to eat at me. The brush system was completely redone for 4.0 but there wasn't much in the way of new functionality for the user (largely because at that point 4.0 was a 5 year project and I was exhausted and needed to ship it). This has been at the top of my list since 4.0's release but I've never had the time to tackle it. More on the time aspect in the next few paragraphs. Suffice to say, things will be coming: more built-in brush types, official custom brush support, pen/stylus and pressure sensitivity support, etc. This is all towards the top of the list. Smoother drawing, of the type you specifically call out, was attempted in 4.0 but only got as far as using the GetMouseMovePointsEx API in order to get a higher sampling rate on the input (which, as it turns out, is buggy since Windows 8, hence the "Fluid mouse input" option for troubleshooting purposes). All of these things have to be prioritized and interleaved along with other work. Crashes and bugs are always a high priority. New functionality has to be weighed with what it adds now, versus what it might complicate further down the road, or if it would be a lot easier once other foundations are in place. Larger work items, like GPU-enabled effects or major upgrades to brushes, can take a few months worth of work. As such, there's only room for a few of those per year. Paint.NET has long suffered from insufficient development resources. As the app has aged, the amount of incomplete modernization work has also piled up. You mention a lot of things that need attention, but you forgot to point out where progress has been made! The Windows Store release was a huge effort, as was the dark theme and other high-DPI work that shipped at the very beginning of this year. There will be continued progress on this front, but don't expect v4.2 to come out and magically fix every last thing. It will tackle some modernization, it will tackle as many bugs and crashes as are needed, it will include some small features, and hopefully 1 or 2 big features. Just like 4.1 did. Also, I think Paint.NET has held up better than most other 14 year old Windows apps that are maintained by small dev shops. I do take this stuff seriously! Lastly, things have improved dramatically on the "time" front this year. I've opened up the private GitHub repo to a few trusted individuals and they have started chipping away at some things (see the change log for 4.1), which is already saving me time and benefitting the user base. I've also been able to allocate much more time to Paint.NET since I left my job* at Facebook in March. This is why 4.1 was able to include the upgrade to Direct2D v1.1 and the GPU effects: there's actually A LOT that changed under the hood, much more than you might think as "just" a user. Not all of that work was specific to enabling GPU effects, but it will pay dividends in other ways in the near term. * yes, this is the first I've publicly mentioned this ... I decided become a "free agent" for now. I'm not working "full time" on Paint.NET, but that's just splitting hairs with the calendar. It is currently the only thing I'm working on, and so it's getting something like 3-5x as much attention as it was before. You mention a lot of things that need attention, but you forgot to point out where progress has been made! Not being in anyway au fait with any type of programming ... I've only used it since 2010 but all to you guys who continue to either update versions or write plugins - well the utmost respect to you's. There's a lot to cover here ... and replying to this will, at the very least, help me to organize my thoughts and is a good opportunity to broadcast what I've been thinking and planning for Paint.NET's future. I love this type of post. 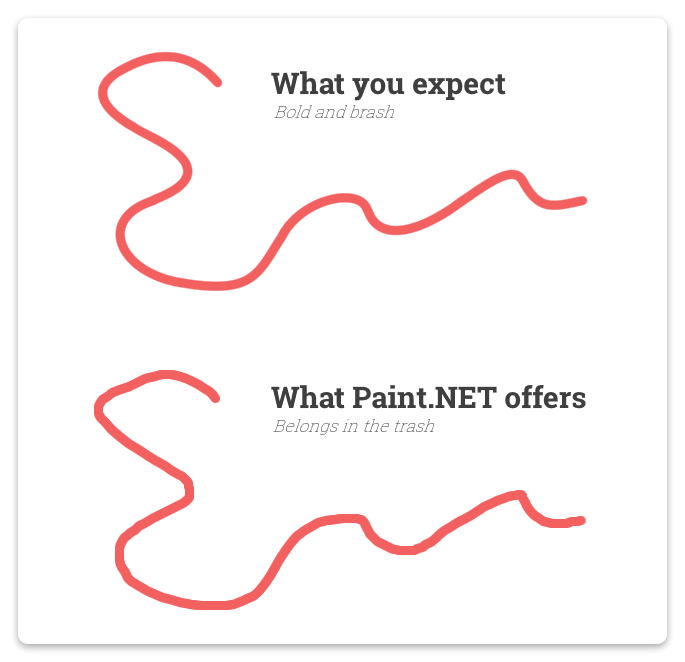 Everyday users get to see a little of what goes on behind the scenes to make paint.net work, how the development cycle operates, and where the app is heading. @welshblue, I meant the plugins that fill the roles of the tools I mentioned are a bit weird. Not because they aren't well made, but because they always have to open a new window for edits and therefore undoing things and trying to make quick changes is a bit of a chore. Neither; it's actually a 3D rendering I made on blender. The background is from a cmd game I made a few years ago that somehow got super broken in a really cool way! 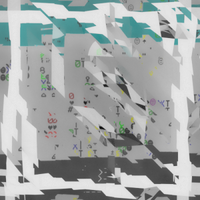 glitch art, anyone? 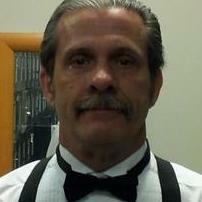 @Rick Brewster, I meant the colors of the components, sorry for not being clear. What I meant was, they are pretty much white on a black background, which is kind of hard to look at, IMO. Just changing the colors (whether that's even possible) to dark gray with white text would make it much, much better. By the way, I did notice the great amount of updates that we've been receiving lately (I'm in love with some of the new 4.1 features!) and that's exactly why I wanted to make this topic; since it means the development isn't dead at all! You mentioned getting help from other trusted users, such as @Ego Eram Reputo to make the new website. The community is full of very talented users, have you considering asking it for help? Surely donations are a really good way of supporting the project, but you are still mainly on your own. For instance, you mentioned how astronomical the job of remaking every single icon would be, but that's the case for a single person. Certainly, a couple of good designers could volunteer to finish those icons in no time. For instance, you mentioned how astronomical the job of remaking every single icon would be, but that's the case for a single person. Certainly, a couple of good designers could volunteer to finish those icons in no time. This is currently being lead by @Zagna. If you wish to help, you should get in contact with him, or leave your comments/suggestions/feedback on the aforementioned topic. I myself am currently reviewing his current iteration of icons, and will be posting my feedback in the coming days for consideration. The home page. Without all the animations it looks a little flat. Wow, that looks really good! My main problem with is just the huge logo; it isn't really that... scalable. It looks a tad ugly when super zoomed in, and it looks even worse with half of it missing. (In fact, @Rick Brewster do you have any plans on updating the logo? It currently looks a bit outdated, with those dark lines and gradients. Also, it doesn't fit with the potential new icon set being made by @Zagna, in case that ever gets used). Italic text should usually be avoided. I feel like the "best" (in "the best free image editor") doesn't NEED to be italic, but it's fine. Try not to make the background too busy when there's text above it; for instance, in the banner, has a lot of white parts with white text above. 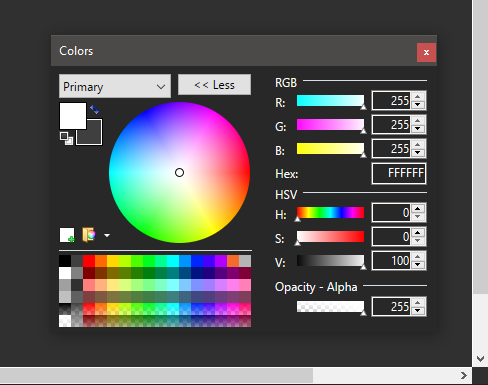 "paint.net is a free image and photo editing application for PC with run the Windows OS". What a mouthful! Not only it's unnecessarily big, it also has writing mistakes ("for PCs with run the Windows OS"). 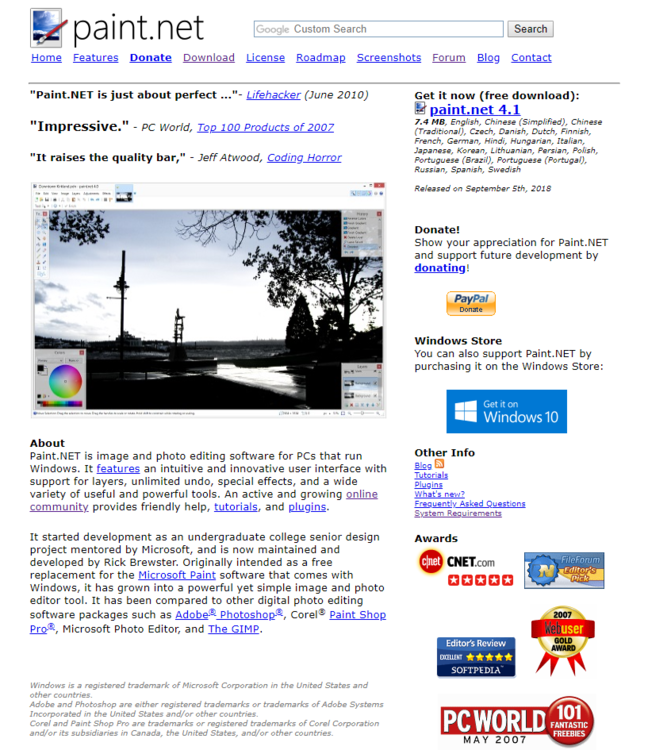 Just sum it up with "paint.net is a free image editing application for Windows". I feel like the gray background on the header buttons could be a little more transparent. Looks a bit too dark. IMO, shading on those green buttons is a big no-no. Just keep them a solid color. The shadows on the same green buttons should be lighter, a little more spread and be moved a few pixels to the left. Also... they're GRAY! Shadows should never be gray; they should be translucent black. It's quite noticeable in the first green button, in the header, since it has a black background. I'm not sure the blue theme is a good choice for those screenshots, the default theme should be used. Also, the first screenshot is squished horizontally quite a lot. The "Get it on Windows 10" button is oddly positioned. Maybe it shouldn't be in one of those topics? I feel like the the second download button is dangerously close to ads. Confusing download buttons is the last thing anyone wants. Personally, I agree with every single one of those. I agree with lots of those too. Plus, you need to scrub the entire site and change "paint.net" to "Paint.NET".